cooking, food, Food swap, foodie, Holly William NIckel, Lincoln Perk, local foods, Salted Creamery, Whatever Happened to Dinner? Finding Harmony Blog is hosting a series of guest posts over the next two weeks on how to break out of food ruts to punch up mealtime with something a little different. First up is Holly Willliams Nickle of Newton, Kansas, who has hosted a couple of Food Swaps; I heard about her from Hannah Heinzekehr, over at The Femonite blog. I asked Holly to explain how a Food Swap works. For me, a home is like a museum without the signs saying “Do Not Touch.” Nearly everything that is part of my daily surroundings has emotional or historical significance, or comes with a tale or memory of where, when and who. My furniture came from my Grandma Mary’s house, my art has been made by friends. My books have been inherited, collected, studied, organized and re-organized from childhood to my present. My home is a virtual timeline of my life and loves, places I’ve been and people I’ve met. Why should my kitchen pantry be any different? 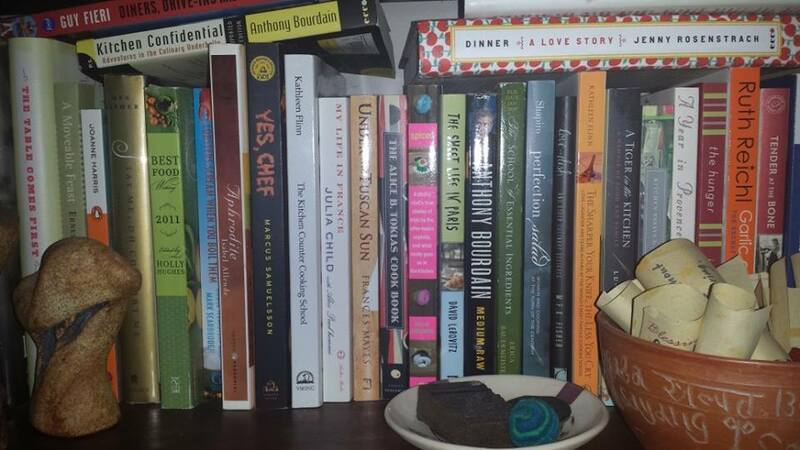 Holly’s collection of memoirs on “authors and food.” All photos from Holly Williams Nickel. Among my collection of books are many, many memoirs of their author’s relationship to food. Films like “Babette’s Feast” and “Chocolat” have always drawn me in with their images of diverse communities gathered around the table to experience the pleasure of food and company. 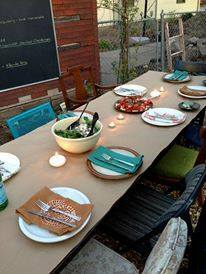 Last spring, I hosted such a gathering in my own yard – rich food, lots of candles, good wine and better company. These are the kinds of moments that I want my life, and the lives of my children, to be filled with. To accomplish both of these ends, that same spring I hosted my first “Food Swap.” I first saw images of food swaps nation-wide in a foodie magazine. I loved the idea of having my own little farmer’s market, full of things grown by people I see in my daily life, right in my own backyard. As I own an artisan ice cream business, I knew what my contribution would be and was excited to send my hand-crafted wares home to my friend’s kitchens, while gathering their handiwork in my own. So, I followed the advice offered on the “Food Swap” website, sent out my invitations, put tables with colorful cloths up in my backyard, and we swapped. When we sit down with our two teenage children and other friends who gather at our table – teenagers seem to multiply themselves – I tell them where the goods came from and about the friends who made them. They get to experience foods that I don’t make, or grow, myself. And they have the knowledge that they are sitting at a table bigger than the one in our kitchen – a table that includes all of the folks who have contributed to our meal and to whose meal we have contributed in return. Holly Williams Nickel owns two shops, Salted Creamery, and the Lincoln Perk in central Kansas. 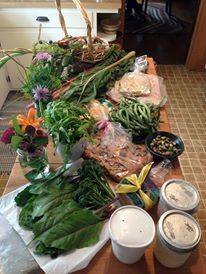 Have you ever planned or participated in a food swap? A variation on it? Comment here to be entered into a drawing for a free copy of Whatever Happened to Dinner. You can share links to similar ideas here, or at my Whatever Happened to Dinner Facebook page, to be entered in the drawing. (Posts for the drawing will close Sept. 30, 2013, midnight). And don’t forget to plan something special for Family Day, Monday September 23. For more on my book, here are study questions, an interview with yours truly, two podcasts with the food editors and me, and a video book trailer. Or think about who might like a copy of the Whatever Happened to Dinner book with about 100 recipes ranging from traditional/old time to foodie! Order here.